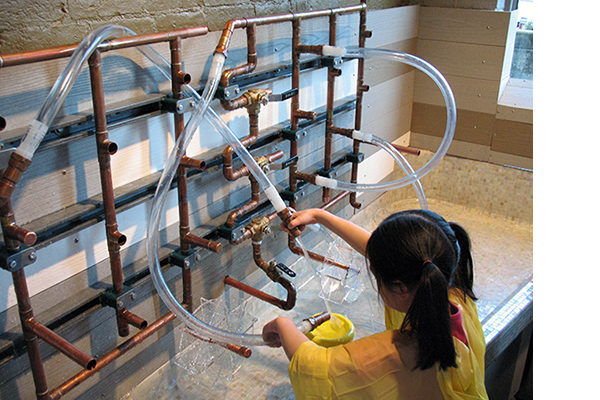 Children are experts at using play to experiment, discover, and inquire. 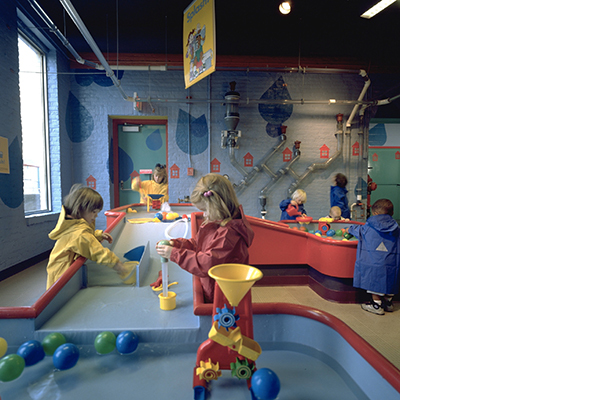 Vehicles of exploration -the city bus, the two-story airplane, the ambulance, and the spaceship – are designed to incorporate role-playing and dramatic play, as well as providing zones for science-based learning. The Louisville city bus scaled appropriately for children features authentic seats and a fare machine. Pretending to be the passenger or the driver, young visitors role-play consulting the iconographic maps, changing the license plates, and driving the bus. In the emergency zone, children steer the ambulance and care for the patient riding in the back. Take Action signs throughout the exhibit transmit messages; in this emergency zone the lesson is how to call 911. By practicing elements of daily life, children feel more confident and capable. Each vehicle is located within an appropriate environment: the plane in the clouds and the bus on a crowded city street. Surrounding the neighborhood is a series of street carts with brightly colored, striped canopies. 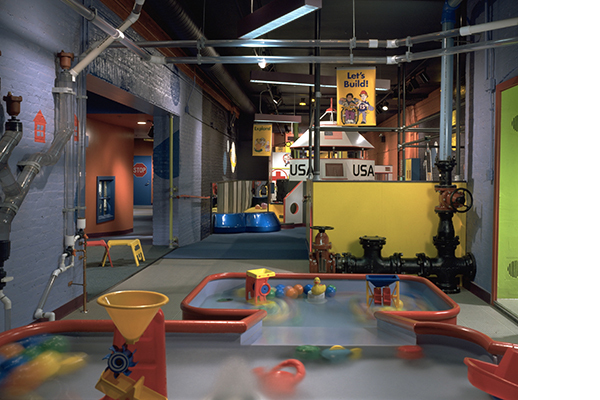 A changing array of “merchandise” is designed to make each vendor unique: children engage in dramatic play with puppets, constructive play with blocks, and artistic play using light boxes. The big, yellow airplane has climbing passages that lead young aviators to the cockpit where they can radio the control tower or to the galley where they can prepare lunch. Sliding right out of the back of the plane, young travelers descend to the cargo area back on Main Street. Across the road, a spaceship has landed. 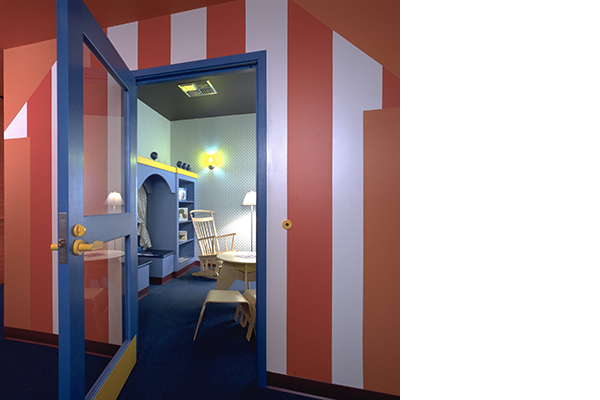 Inside is an intimate nook where caregivers and children sit together to read. The lunar module has plenty of windows for viewing the stars and moons, many of which orbit above the nearby pre-walker zone. Babies crawl, touch, and enjoy their own tactile, padded moonscape. 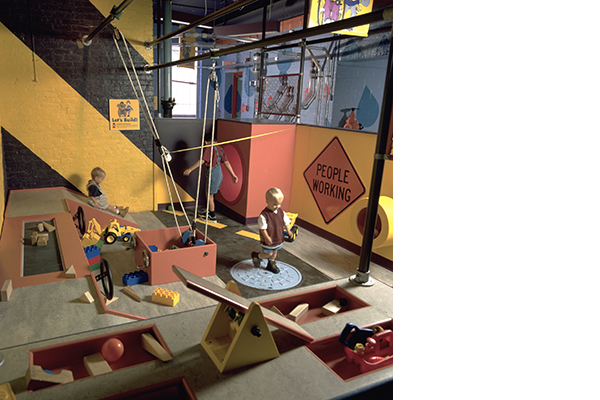 At the construction zone, children don hard hats and operate dump trucks while experimenting with pulleys, magnets, and fulcrums. 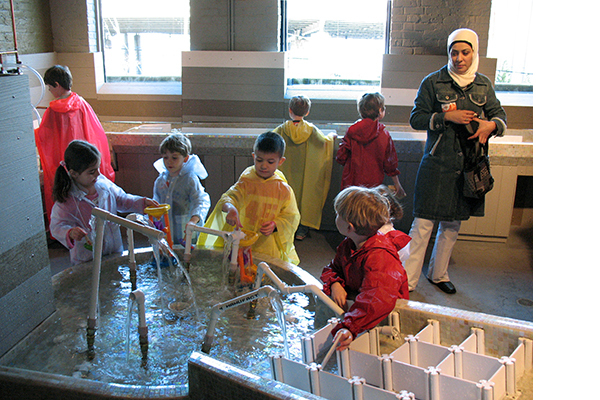 With a view of the Ohio River, kids get wet at the water table exploring the properties of water. It features several levels for circulating water, places to dam it up, and boats and fish to move about. 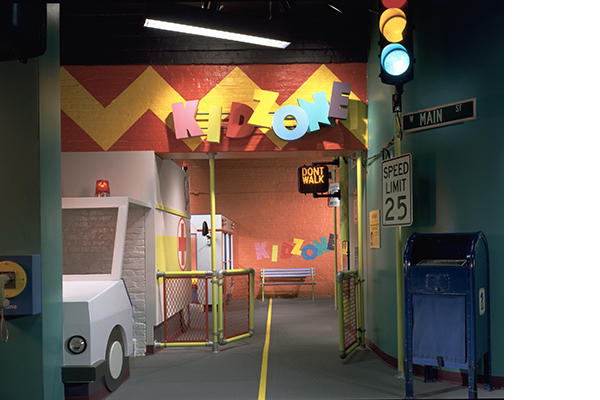 KidZone with its themed environments is a playful, hands-on scientific cityscape for children and their caregivers.